I’m in Italy and find myself at the headquarters one of cycling’s most iconic brands, Castelli. 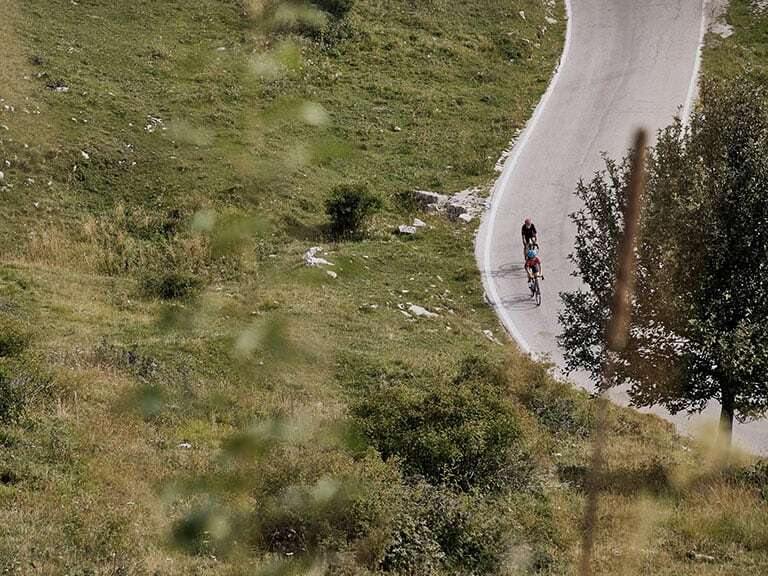 Yesterday I was baptized into the scenic Dolomites with a guided ride up Monte Grappa, which included a little more vertical than what I am used to in Quebec. 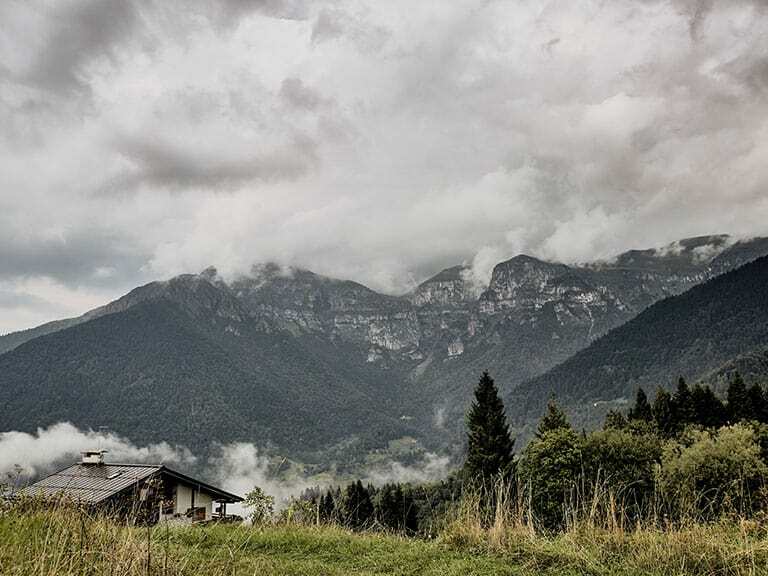 Despite defining myself as a cycling enthusiast – I hit the road every non-snowy weekend and regularly undertake multiple weekday rides – my legs have yet to recover from the gruelling ascent. 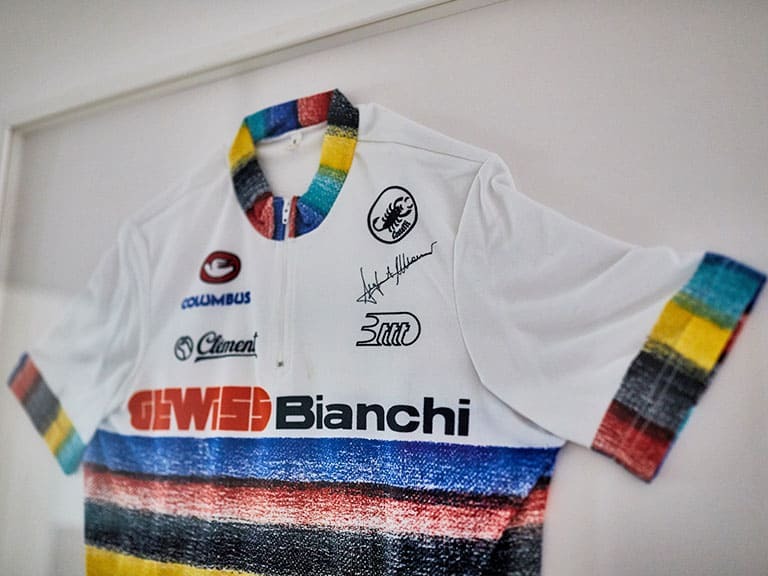 After traversing wide hallways lined with legendary riding memorabilia – think winning jersey’s from the Giro d’Italia and autographed photos of past and current Castelli riders’ – I’m seated in a well-lit conference room, waiting. But I’m already used to everyone being on Italian time. Who I’m waiting for happens to be Castelli Performance Director, Andrea Peron. Peron’s 15-year professional career included being a member of a World Champion winning Italian team, earning an Olympic Silver Medal in Barcelona, and securing a top-10 finish at the 1999 Tour de France. To say Peron’s an expert on all things Castelli is an understatement, and I’m looking forward to speaking with him about the brand’s gear, his role, and the rigors of professional cycling. When Andrea does arrive, it’s with a winning smile that makes it easy to forget about his tardiness. He’s wearing a trendy Castelli T-shirt, jeans, and sipping a cappuccino. Everything about his look seems to suit his laidback and open persona. AS: Andrea, thanks for this. It’s a pleasure to meet you and to ride the Italian roads with Castelli. AP: Then I’ll start us off with the first question. How was Monte Grappa yesterday? AS: I wasn’t expecting it to be so hard! It’s nothing like back home in Quebec. AP: You know if there’s one place I’d love to cycle it’s Canada. They have the longest cycling route in the world. AS: Anytime. I’d bring along the Castelli Climber Jersey, which I wore yesterday. Believe it or not, Canada can be really hot in the summer. That jacket is so light and breathable – thank goodness because it was cooking out there on Monte Grappa. What’s your go-to product in the Castelli family of products? AP: The IDRO Gore-Tex coat. It makes a big difference on long rides. It’s so light and packable I stow it in my back jersey pocket. It’s my savior if it rains. Which it often does in the mountains. AS: And for saddle shorts? AP: Nothing better than the Free Aero Race 4 bib, which is actually the bib of our pro team, Team Sky. Pair that with the Progetto X2 Air chamois and you have the most advanced kit in our line. AS: I had the Progetto on yesterday too. The breathability and comfort were amazing. Are these qualities the main drivers in the entire collection? AP: They have to be. The Grand Tours are usually in the summer heat, and if it works for our pro teams it will most likely work for our clients too. Luckily, technology and engineering have changed quite a bit since I was a pro. AS: Let’s speak about that. Your role here is to be the bridge between the company and the sponsored teams, right? AP: That’s it. I’m the Performance Director and liaise between the two. I communicate new ideas and other things from one to the other, be it from our pro cyclists to our design team, or the other way around. I also handle R&D and innovation. The pro cyclists test our products and I make sure that all comments and corrections to the gear and apparel make it to the regular collection to serve our clients. AS: You, and of course Castelli, seem to put a lot of emphasis on professional riders and teams testing your new products. AP: Equipping pros and teams with new products is the best way to test our stuff. After all, pro cyclists spend a really long time on their bikes putting our gear through the paces, so who better than them? AS: When we saw your brand manager Steve Smith yesterday, he had next season’s Team Sky jersey in his hands, but hid it before we got a good look. Can you tell me more about what to expect? AS: Tell me a bit about your pro career, like when you won the World’s for the team time trial. AP: [laughs] That was a while ago now, back in 1991… I was a pro for 15 years. I was the lead cyclist for all the big races, like the Tour de France and the Giro d’Italia and other classic events. AS: It must be good to be able to say you lived out your passion? AP: It was a huge opportunity because so few get to really do it. But in all honesty, the cycling world is a lot less glamorous than you might think. AP: It’s an unbeatable experience, but really hard on your body and your mental strength. I don’t know many people ready, willing and able to spend more than 200 kilometres sitting on a hard plastic seat in a pretty uncomfortable position. AS: As well as racing, I imagine there’s a fair bit of training to do. AP: That’s right. Pro cyclists usually spread training throughout the week in order to max recovery time between races. I’d generally train about 6 hours daily, three times a week. AS: How does a cycling team work? And what was your role on the team? AP: Cycling is not a solo sport. The team leader needs a good squad of riders to get him to the head of the pack and to help win the stages. Early on I had the potential to win races. Later I found I liked it more to help those with the same potential to win them. I was pretty versatile: I have a World Champion’s medal in time trial and I was a good climber if the inclines weren’t too steep. I mean, I did finish 10th at the Tour de France in 1999. AS: And the silver medal at the Barcelona Olympics. What’s it like to finish at the top levels of the big races? AP: Those are among the best moments of my career. But there’s a big difference going from top ten to top five, even getting to the podium is a completely different thing! AS: What would you eat while competing? AP: Over one day during a stage, a cyclist can easily burn up to 4000 calories. It’s all about changing it up in the kitchen. You get tired of eating pasta for three weeks straight, even if, as a good Italian, I do love my pasta! AS: As an ex-pro are there days when you don’t want to ride? AP: Of course! Some days I don’t want to ride at all, like when it rains or when it’s boiling hot like yesterday. AS: What are you most proud of, looking back over your career? AP: Hard to pick out one thing, but probably the feeling that I went to the limit of what I could accomplish, which makes me proud. AS: And how about in terms of your involvement with Castelli? 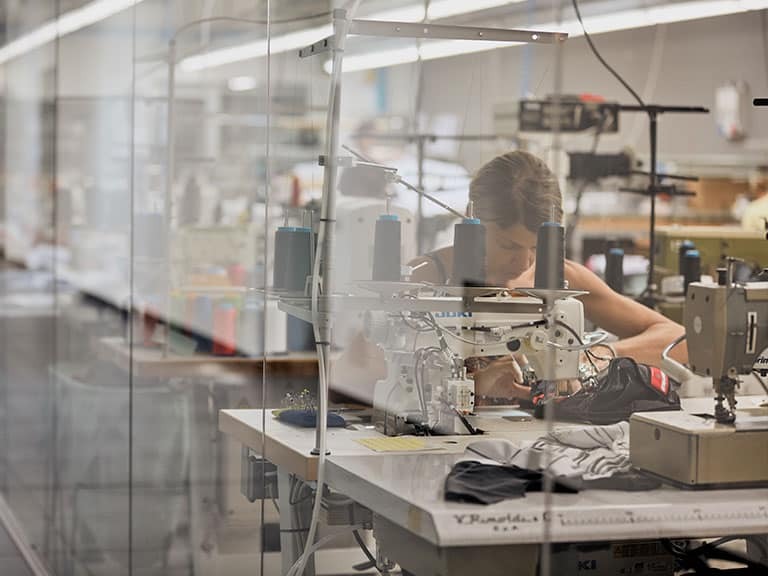 AP: I’m proud to contribute to innovation and the development of cycling apparel. My role here at Castelli makes sure that our everyday cycling fans and enthusiasts who buy Castelli benefit from the exact same tech that our pros use daily. Maybe it’s the way I give back to the community that’s supported me through my career as a pro and beyond.